Kitchener-based Melissa Doherty and Halifax-based Sarah Maloney are mid-career artists who both take up the fine craft of making exquisite objects from imagery found in nature to explore the construction of gender, power, and desire. Working in sculpture, textile, and painting, these artists use both image and material as metaphors for reflection, isolation, and comfort. Doherty is interested in how contemporary culture manipulates the (real and imagined) landscape as if it were a toy. Layering paint to the extent that individual brush marks disappear, the artist creates lush sensual surfaces with a terrific sense of depth. Her super-real aerial and close-up paintings depict single trees, as well as the urban forest, from a scopic yet intimate point of view. Doherty’s method of depicting topography permits viewers new readings of landscape metaphors, shifting the grand landscape tradition from the sublime toward notions of embodiment. Maloney’s sculpture series Reflection is informed by three types of (bronze) lady slipper orchids, which sprout from hand–crafted, mirrored dressing tables, chairs, and recliners. 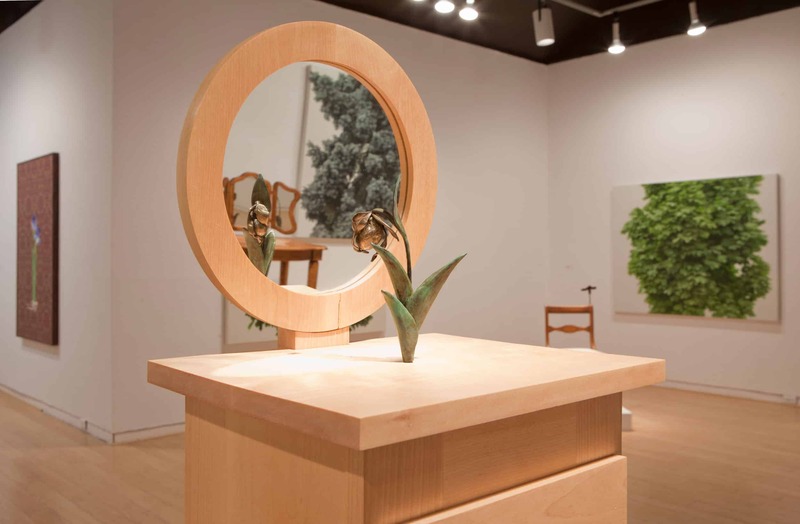 Transformed as subject and object into bronze sculpture, the flower with the common name lady slipper is presented as part of an intimate piece of bedroom furniture, one which permits gallery-goers a 360 degree view of the feminine stand-in. 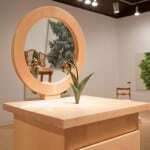 Since spectators can only see the flower sculpture fully in the round through the reflective properties of the artist’s dressing table mirrors, the gaze becomes a central theme of this work. 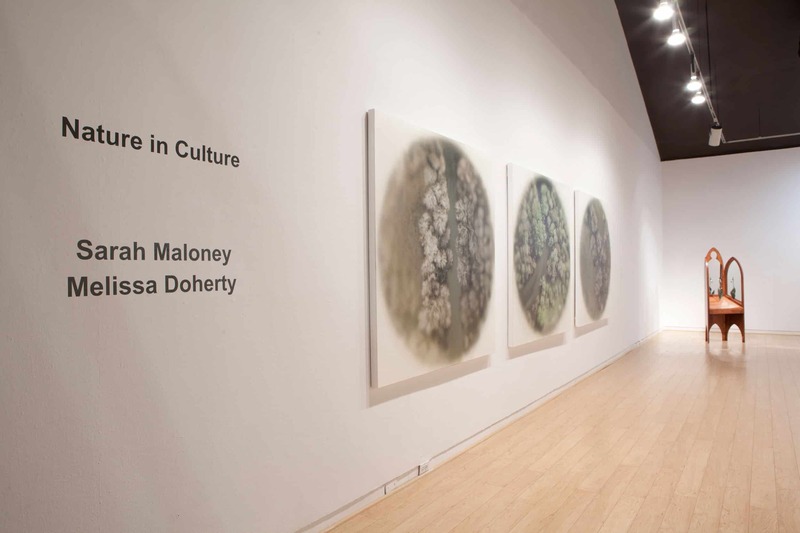 In this way Maloney’s interest in the representations of plant forms finds an intersection with Doherty’s interrogation of the landscape genre.